The Divinity Collar - Heaven in Leather Form by Mistress M.
Due to our style of play, this isn't a collar that we can use for actual play. For that, we would need a much more substantial closure than the snaps. That being said this is a great show collar or costuming piece... if you don't have metal allergies. The designers covered most of the metal that would be on skin, but left two pieces in. It can be covered by nail polish, but it may get into the faux fur and mess that up. This is the Divinity collar by Spartacus. This is suitable for play or for show for most players. Because we play with consentual nonconsent, we need gear for play that is a little harder to get out of, so for those like us, this ends up being a show collar. It's also fantastic for costuming. I can see all sorts of fun costumes with this piece. Overall, this is a nice collar. The leather is a reasonably thick leather. The leather actually doesn't smell like leather that much at all. The edge of the leather is left unfinished or covered which means it's a little rough, but it will soften over time, The back of the leather has faux fur. 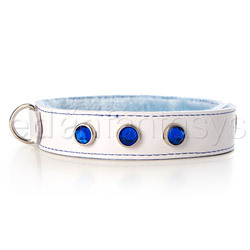 The fur is stitched onto the leather is a dark blue thread which is sturdy and makes a nice contrast. The metal hardware is sturdy. The fit is comfortable. The closure is snaps. There's a snap about half an inch a apart for a total of 4. It'll fit a range of sizes. It's going to fit about 12" - 16" which will fit most people, but there are some that this won't fit. The metal is all covered by the faux fur except for the rivets holding the d-ring on. Those are exposed on the skin. This is kind of confusing. If they though to cover everything else, why didn't they cover that? I have a metal allergy, so I was rather disappointed at that over sight. The rhinestones are plastic, but it's only super noticeable when you are close. Like within a foot of them and with good lighting. From far away they look like they are nicer quality than they really are. The metal on my skin makes this difficult for me to use for long periods. Normally, I would cover it with nail polish, but I am worried of getting it in the faux fur and making a mess. Wearing it, aside from that issue, is comfortable if a bit warm. I think I will be looking forward to winter with this one. The faux fur and leather do not breathe. Keep it dry and cool. Leather can crack in heat and direct sunlight. If you need to clean it, spot clean it and let it dry before putting it away. Glad you picked it up. Thanks for sharing! Thank you for viewing Divinity collar – collar review page!